Stems: Erect, stout, clustered, usually unbranched, leafy, rough-hairy. Leaves: Alternate, simple, long-stalked below, sessile above, broadly ovate to lanceolate, 2 to 10 inches long, 1 to 4 inches wide, thick, rigid, rough on both surfaces or somewhat glabrous beneath; margins mostly entire; tips pointed; upper leaves reduced. Inflorescences: Corymb-like, flat-topped to rounded, densely flowered, terminal; heads about 3/8 inch wide; bracts firm, rounded. Flowers: Ray florets 7-14, about 1/4 inch long, yellow; disk florets 19-31, yellow. Fruits: Achenes, ribbed, glabrous, tipped with whitish bristles, enclosing small seed. Habitat: Dry open prairies, pastures, and hillsides, on rocky or sandy sites. 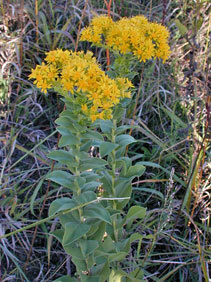 Comments: Rigid goldenrod has deep roots that allow it to compete well with native grasses. It increases in overgrazed pastures.